Shocked is not strong enough a word. 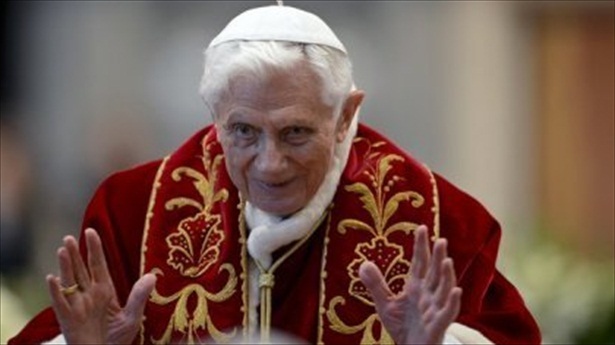 A truly sad day, but what a wonderful papacy it has been. I have convoked you to this Consistory, not only for the three canonizations, but also to communicate to you a decision of great importance for the life of the Church. After having repeatedly examined my conscience before God, I have come to the certainty that my strengths, due to an advanced age, are no longer suited to an adequate exercise of the Petrine ministry. I am well aware that this ministry, due to its essential spiritual nature, must be carried out not only with words and deeds, but no less with prayer and suffering. However, in today’s world, subject to so many rapid changes and shaken by questions of deep relevance for the life of faith, in order to govern the bark of Saint Peter and proclaim the Gospel, both strength of mind and body are necessary, strength which in the last few months, has deteriorated in me to the extent that I have had to recognize my incapacity to adequately fulfil the ministry entrusted to me. For this reason, and well aware of the seriousness of this act, with full freedom I declare that I renounce the ministry of Bishop of Rome, Successor of Saint Peter, entrusted to me by the Cardinals on 19 April 2005, in such a way, that as from 28 February 2013, at 20:00 hours, the See of Rome, the See of Saint Peter, will be vacant and a Conclave to elect the new Supreme Pontiff will have to be convoked by those whose competence it is. Once the shock wanes a little, some questions will have to be addressed. Where will he live? What role will a Pope-Emeritus play in the life of the Church? How will his successor relate to him? “Where will he live?” If I’ve understood the reports correctly, in a “cloistered monastery in the Vatican”, which presumably means: with the Benedictine Nuns at Mater Ecclesiae. When renovation work on the monastery of cloistered nuns inside the Vatican is complete, the Holy Father will move there for a period of prayer and reflection. “… a period of prayer and reflection”. So it is not intended to be his permanent home. No one seems really to know what to do with him. My money is on his living with Georg somewhere quiet, well as quiet as possible given the need for the security he will always have to have. According to the Times today, the nuns actually moved out in November 2012 – so is he going to live there on his own? Could you not set aside a couple of rooms at Douai?! My dear Ben, if it were left to me I would build him a discreet wing all to himself, nothing grand just bedroom, study and library, a reception room, full bathroom with necessary facilities for his elderliness, room for his cat and his piano, and for his brother Georg of course, private garden and a view of the sheep. But the nuns will be moving back to Mater Ecclesiae. They moved out for the renovations which, I am hearing whispered, the nuns knew the reason for. You can trust cloistered nuns to keep a secret.